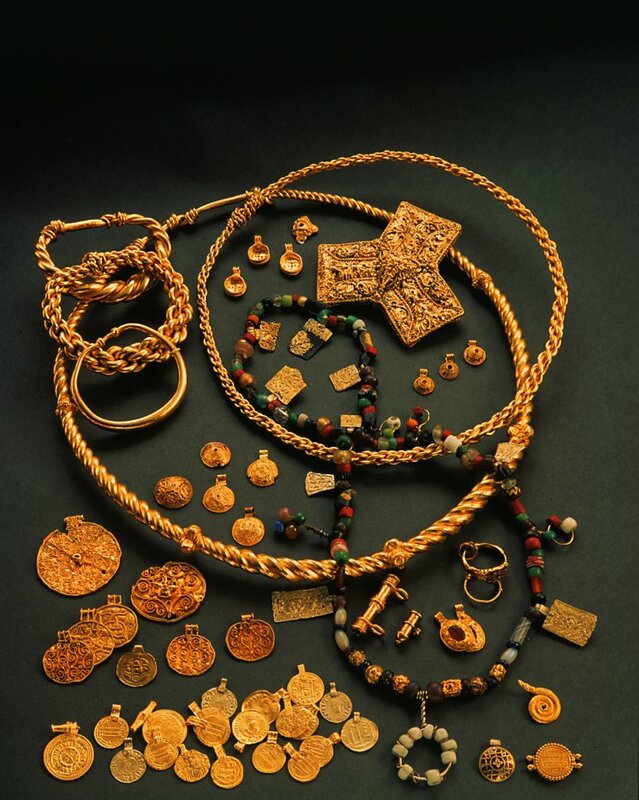 The Hoen Treasure is the biggest finding of gold jewelry from the Viking Age and one of the most important European collections of jewelry from the 800s. It consists of 20 coins, 50 jewelry of various types and 125 pearls totaling approximately 2.5 kilos of gold. The treasure was found in 1875 in connection with trenching on the Hoen farm by the Drammenselva river in Buskerud county. The place was strategically located in relation to travel routes in the Viking Age and control of goods between the inner parts of Eastern Norway and the coast. The gold was probably buried in the marsh between 875 and 900 AD and confirms that Hoen was an important chiefdom with international connections. Spanning nearly 500 years, the oldest coin is Roman and dated to 364-367 AD while most of the coins are Arabic from the 800s. The majority of the jewelry has been dated to the same period, and the youngest coins indicate that the treasure probably was buried between 875 and 900 AD. The decor shows that a big portion of the artefacts is Carolingian – i.e. from the Frankish Empire. The other objects include a Byzantine medallion, an English gold ring and two reliquaries from the Mediterranean region besides Scandinavian and continental metal works. Many of the objects may originate from ravages along the rivers Seine and Rhine, ransom money to raise a siege or for the release of a powerful person. Many experts have discussed the discovery. Some believe it is a sacrifice to a Norse god while others think the treasure has been wrapped and hidden – perhaps in connection with war and unrest. It is certain that a woman has worn the Hoen jewelry but a man could also have used the neck rings. One theory is that the objects belonged to a rich and powerful woman who has invested in equipping ships that went Viking, and that the gold is her share of the revenue. Another theory is that they have belonged to a priestess (Old Norse: vǫlva). 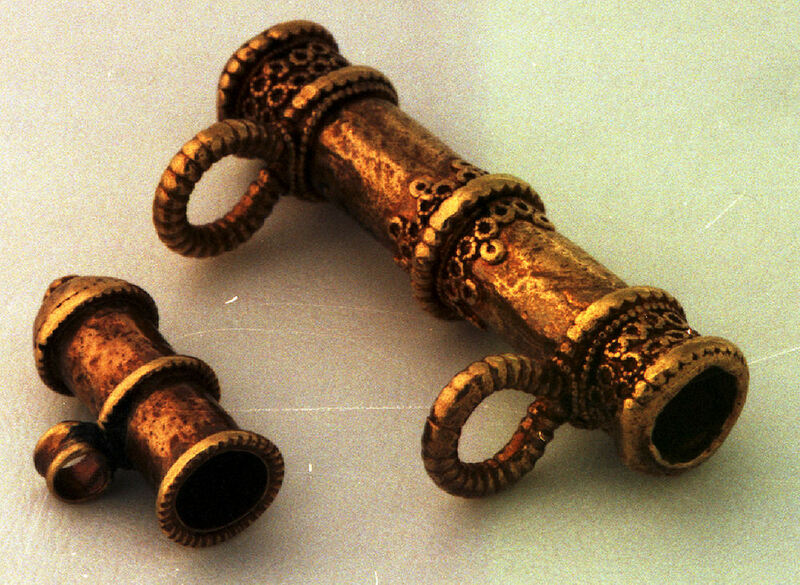 Although the Hoen finding has been linked to Viking raids, it is not possible to determine whether the objects are collected through looting, trade or exchange of gifts. 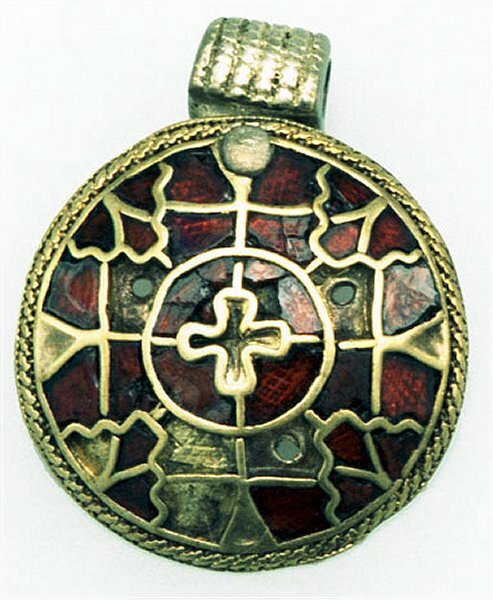 It appears that gold and silver jewelry almost never was placed in Viking graves, and it is therefore found very few examples from this period.